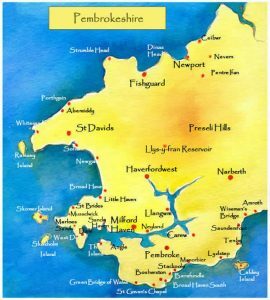 Books have been written on the beauty of the beaches of Pembrokeshire and this is just a brief guide to their location and basic facilities. Pembrokeshire beaches have won more blue flag awards than the rest of Wales together. There is a wide variety of dog friendly beaches however restrictions may apply on some beaches during the summer months – dogs may be permitted only on a specified part of the beach or, in a few cases, banned altogether from May to September. POPPIT SANDS Most northerly of the Pembrokeshire beaches with wide open sands along the Teifi River estuary. Approached from Cardigan and through St Dogmaels. The Coast Path starts, and ends, here. Ample parking with cafe and toilets. CEIBWR BAY A narrow cove reached from Moylgrove with pebbles and rock backed by some of the highest cliffs in Pembrokeshire. Limited parking and no facilities. NEWPORT SANDS Vast sandy mile long beach backed by sand dunes and overlooked by golf-links. Very popular and with ample car parking and facilities. Reached by turning off the main road as you leave Newport for Cardigan. NEWPORT PARROG Small sand and pebble beach within easy reach of the town centre and its facilities. Location of Newport Boat Club. Good car park with toilets. CWM YR EGLWYS Shingle beach with sand at low tide popular with families and sailors. Set back a few yards from the beach is the ruined Church of St Brynach which was destroyed in the great gales of October 1859. Reached by a narrow road from the main road north of Dinas Cross. Small car park and toilets. PWLLGWAELOD Sheltered grey sandy beach with ample parking and toilets. A bracing walk along the Coast Path will take you around 'Dinas Island.' Access by turning off the main road in Dinas Cross at the Ship Aground Inn. GOODWICK PARROG A sand and shingle beach overlooking Fishguard Harbour and sheltered by the breakwater and backed by a grassy bank. Safe bathing and popular with families. Ocean Lab features 'Ollie the octopus', cyber cafe, ocean quest, coffee shop, soft play area for under fives and tourist information centre. Plenty of parking space and toilets. Shops, pubs and Post Office close by in Goodwick. ABERBACH Reached by a narrow lane from near Tregwynt Woollen Mill, Aberbach has a sandy beach at low tide backed by a shingle bank. Parking difficult and no facilities. ABERMAWR Quiet sandy beach adjoining Aberbach and again backed by a shingle bank. Once considered as the main terminal for transatlantic steamers. Look for the remains of a petrified forest at low tides. Signposted from the main Fishguard to St Davids road but limited parking on the roadside. No facilities. TRAETHLLYFN One of the best beaches in Pembrokeshire but seldom crowded because of its difficult access. Large expanse of yellow sand overlooked by 150 feet high cliffs. Owned by the National Trust and reached by a private road through Barry Island Farm from the Croesgoch to Porthgain road. Steep steps lead down from the car park. Alternatively park at either Porthgain or Abereiddy and walk along the coast path – about half a mile in either direction. No facilities but there is a great pub and restaurant in Porthgain. ABEREIDDY Clean but almost black sand caused by the action of the waves on the slate cliffs. A popular beach with ample parking and toilets. Just over the headland to the north is a huge pool created by slate quarrying and known locally as the Blue Lagoon. The lagoon was the venue for the RedBull cliff diving competitions. A railway once joined Abereiddy to the tiny port of Porthgain. WHITESANDS BAY One of the best and most popular beaches in Pembrokeshire with a vast expanse of golden sand backed by sand dunes and surrounded by impressive coastline. Carnllidi rising to 600 feet behind commands spectacular views of the coastline and Ramsey Island. Very busy in the summer and popular with families, surfers and canoeists. Ample parking, shop and toilets, and two miles from the centre of St Davids. CAERFAI BAY Sandy beach at low tide reached by a steep track and steps down the cliffs. Small car park but no other facilities. GWADN SOLVA Small, pebbly beach reached by footpath over the Gribin headland from the car park at Solva Harbour. No facilities at the beach itself. NEWGALE SANDS A popular sandy beach, 2 miles long, backed by an impressive pebble bank. Popular as a surfing beach. Car parks and all facilities nearby. At extremely low tides the remnants of a 'prehistoric' forest may be seen. NOLTON HAVEN Small sandy cove overlooked by hotel. Parking nearby. DRUIDSTONE HAVEN Long sandy beach but with difficult road access and very limited roadside parking. No facilities. BROAD HAVEN Large sandy beach and one of the most popular in Pembrokeshire. Parking and all facilities in the village. SETTLANDS Sandy beach reached by low tide from either Broad Haven or Little Haven or by steep steps down from the narrow road. No parking and no facilities. LITTLE HAVEN Small sandy cove and also a popular sailing centre. All facilities in the pretty village. Large car park. Look out for fresh fish landed in the evening. ST BRIDES HAVEN Attractive tiny cove of sand and shingle but no facilities. MUSSELWICK SANDS Fine sandy beach but no parking or facilities. Access along half-mile footpath to the west of Marloes. MARLOES SANDS Very large sandy beach but no facilities. Access along half a mile footpath from car park one mile to the west of Marloes. Recommended by many guides as one of the best in Britain. DALE Shingle and sand beach and a popular boating centre. The sunniest place in Wales with picturesque cottages lining the shore. Limited parking at peak times and all village facilities nearby. A mile to the west is Westdale Bay, a sandy beach backed by shingle and cliffs – Access is over a field and no facilities. SANDY HAVEN Sandy beach along a pretty creek backed thickly wooded banks. Parking and toilets if approached from Herbrandston. WEST ANGLE BAY Sheltered sandy beach facing west with large car park and all facilities. FRESHWATER WEST Vast sandy beach backed by sand dunes with parking and toilets. BROAD HAVEN SOUTH Sandy beaches backed by sand dunes with short but steep walk to beach. Car park and toilets. Beach can also be accessed via the beautiful National Trust lilly ponds at Bosherston. BARAFUNDLE BAY Often quoted as the best beach in south Pembrokeshire with golden sands backed by sand dunes. Parking at Stackpole Quay with a half-mile walk and steep descent to the beach. No facilities. FRESHWATER EAST A wide sandy beach backed by sand dunes with car park and all facilities. MANORBIER Sand and pebbly beach overlooked by castle. Car parking and toilets with village nearby. TENBY Four sandy beaches to choose from. The South Beach is the largest with golden sand and views towards Caldy Island. Castle Beach is small and sheltered and Harbour Beach gives you immediate access to the picturesque harbour. North Beach is also large and is the crowdiest in the summer. All facilities nearby and in the town. SAUNDERSFOOT Popular sandy beach with large car park and all facilities. Popular sailing centre. A tiny, popular resort well worth a visit. COPPET HALL Sandy beach with easy parking and all facilities. WISEMAN'S BRIDGE Some sand at low tide but otherwise pebbles and rocks. Limited car parking but all facilities. Used for a full-scale rehearsal of the D-Day landings in World War 2 and visited by Winston Churchill at that time. AMROTH Sandy beach backed by pebbles and with breakwaters. Large car park and all facilities in the village. The Coast Path starts, and ends, here.